Ewell Blackwell (October 23, 1922 – October 29, 1996) was an American right-handed starting pitcher in Major League Baseball. 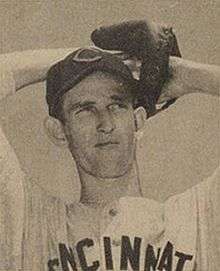 Nicknamed "The Whip" for his sidearm, snap-delivery, Blackwell played for the Cincinnati Reds for most of his career (1942; 1946–1952). He also played with the New York Yankees (1952–1953) and finished his career with the Kansas City Athletics (1955). The 6 ft 6 in (1.98 m), 195 lb (88 kg) Blackwell is considered to have been one of the greatest pitchers of his era, and starred in a six-year streak in the All-Star Game from 1946 through 1951. He was the winning pitcher of the 1950 All-Star Game, getting Joe DiMaggio to ground into a game-ending double play in the 14th inning. On June 18, 1947, Blackwell pitched a 6–0 no-hitter against the Boston Braves. In his next start, June 22, against the Brooklyn Dodgers, he took a no-hitter into the ninth inning, trying to tie the achievement of his veteran Reds teammate Johnny Vander Meer from nine years earlier, of throwing consecutive no-hitters. However, the no-hit attempt was broken up Eddie Stanky. The Reds won the game 4–0. In a 10-season career, Blackwell posted an 82–78 record with 839 strikeouts and a 3.30 ERA in 1,321 innings pitched. In 1960, he was inducted into the Cincinnati Reds Hall of Fame. During a 2007 New York Mets broadcast, Blackwell was referred to as the best right-handed pitcher ever by Hall of Famer Ralph Kiner. Dodgers broadcaster Vin Scully also reported that batters were genuinely afraid to face him. Blackwell's best year was 1947, when he recorded 22 wins against 7 losses, including 16 consecutive complete game victories for a weak-hitting team. At a slender 6 ft 6 inches, he was one of the first very tall pitchers, and a fearsome sight to hitters of that era. His bizarre sidearm delivery, described by a leading sports pundit as "looking like a man falling out of a tree", put unusual strain on his arm, abbreviating his success and, ultimately, his career. Along with arm problems, Blackwell had his right kidney removed in January 1949 after it became infected, and then had an emergency appendectomy in September 1950. In 1948, Ziff-Davis Publishing Company produced "The Secrets of Pitching, By Ewell Blackwell". It is a short book that gives good advice for young pitchers." ↑ Linkugel, Wil A (1998). They Tasted Glory: Among the Missing at the Baseball Hall of Fame. United States: McFarland Publishing. p. 272. ISBN 9780786404841.